9+ Party Planning Templates – Free Sample, Example, Format Download! Do you intend to throw a bash? Think of a Party Planning Template. Of course, the most memorable parties are always those with the best plan. However, it is usually hectic to arrange for such events especially if the organizers are doing it for the first time; hitches usually occur at the last minute and this might spoiling everything. It does not however have to be this way if you observe proper party planning and use the Best Meal Planning Templates. thinkaboutit.net | Party Planning Sample is a free Word Template which helps you plan an memorable party without hitches. Our party plan template is designed to take care of your room/location, Invitations and Other Print Materials, Fundraising, Photographer, Videographer, Lighting, Transportation, DJ or Band, Toasts or special speeches, Party favours/memories and your party theme Decorations. kenoshabridalexpo.com | Bachelorette Party Planning Example is a Free PDF Template designed to help you plan a perfect bachelorette party. 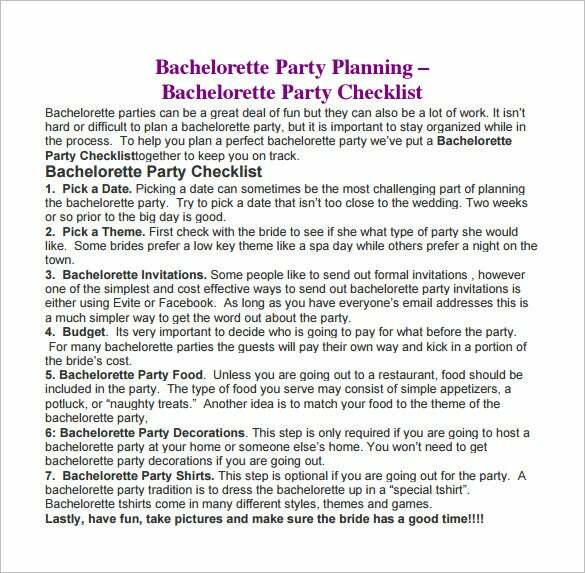 Our plan template have put a Bachelorette Party Checklist which includes Theme details, Invitations, Budget, Bachelorette Party Food, Bachelorette Party Decorations. This checklist will help to be on track and organize a great party. christmas.organizedhome.com | Sample Holiday Party Planner is a Free PDF Template which is designed to help you professionally organize an holiday party that will help you enjoy your party as much as your guests. Our plan template have put a holiday Party Checklist which includes date, time, occasion, guests, menu, seating table layout. bishopswoodgc.co.uk | Christmas Party Planning Example is a Free PDF Template which is designed to help you professionally organize an Christmas party that will help you your guests enjoy the party as much as you. Our plan template have put a Christmas Party Checklist which includes date, time, budget, venue, guests, menu, Music and Entertainment. bluerentals.net | Wedding Anniversary Party Planning is a Free PDF template which is designed to help throw an unique Wedding Anniversary Party. The template lists eight unique Wedding anniversary party ideas like Tropical Flair, Big Family Barbecue, Romantic Dinner Cruise, Year We Got Married, Fiesta, Hollywood Love Story, Interesting Location and Destination Anniversary. To do this, try to know who and who will be coming. This you can do by dispatching invitation letters to everyone and requesting them to confirm attendance before a particular date. You can also indicate in the letters the maximum number of people that one can invite by using Plan Templates.